The Email Address field is used for entering a single email address and will only pass validation if the value entered is in a valid email format. Use the Confirmation Field option to require a user to confirm that the information they entered in a field is correct. For more information see the Confirmation fields page. 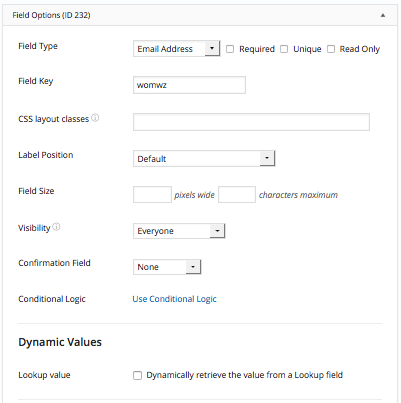 You may automatically populate an Email Address field with the current user's email by putting [email] in the field on the form builder page. The default value icons can be used to specify whether the text entered in an Email Address field on the form builder page should be a default value or a placeholder. Learn how to set a default value and how to set a placeholder in a text field. Display the value submitted in an Email Address field in a form's confirmation message, email, or View. Just insert [x], where x is the ID or key of the Email Address field. You may use an Email Address field as the Reply To address when setting up an email notification. You may also use an Email Address field to set up an autoresponder, which essentially is just an email notification that is sent to the user who submitted the form.